All the coffee shops have gone pumpkin spice crazy (coffees, donuts, bread, and muffins, oh my!) and I’ve have jumped on the bandwagon. Lately, I’ve been in the drive-through line ready to order a large regular coffee and then changed my mind for the PSL (pumpkin spiced latte) as soon as I see the advertisement on the order board. I can’t help it. I’ve always enjoyed the sweet and spicy flavours of pumpkin spice mix, which may include cinnamon, ginger, nutmeg, allspice, and ground cloves. There is just something about these warming spices that I crave during chilly fall days. I’ve recently made a Pumpkin Spice Butterscotch Popcorn and Pumpkin Chocolate Chip Whole Wheat Muffins, which includes cinnamon, and even a savoury One-Pot Spaghetti with Pumpkin Sauce (with nutmeg). Maybe I just have a pumpkin obsession. It doesn’t help that I’ve been pinning (on Pinterest, of course) all the pumpkin recipes I can find. I want to make them all, but my waistline and food budget could only handle so much. Anyway, this recipe came about one morning when I had one of those cravings for pumpkin spice “something” quickly and didn’t feel like leaving the house to go get it. So I needed to make a recipe that I had all the ingredients for. All the ingredients! The exact amounts are listed in the "Ingredients" list below. I thought, “why not add a little spice and pure pumpkin puree to a protein smoothie?” Yes! Fast and simple. Just place all the ingredients in a blender and blitz it up until smooth and creamy! Perfect for a quick breakfast or as an after workout drink. I had Scott try this smoothie after his morning workout and he loved the creamy texture and distinct flavour of the pumpkin spice. He said it was like drinking peanut butter (in terms of smoothness) without the fat. I listed a do-it-yourself recipe for pumpkin spice mix in the “Notes” section of the recipe, but feel free to use your own or a store-bought mix if you prefer. In addition to the pumpkin spices and puree, I used a plant-based vanilla protein powder along with rolled oats for added protein, frozen bananas for added sweetness, and almond milk for additional flavour and to help make an easy-to-drink, delicious smoothie! I also like to sprinkle a little ground cinnamon on top as a final touch! I hope you enjoy this recipe! Let me know what you think by commenting below if you make this! Place the ingredients in a high-powered blender and blend on high speed until smooth. 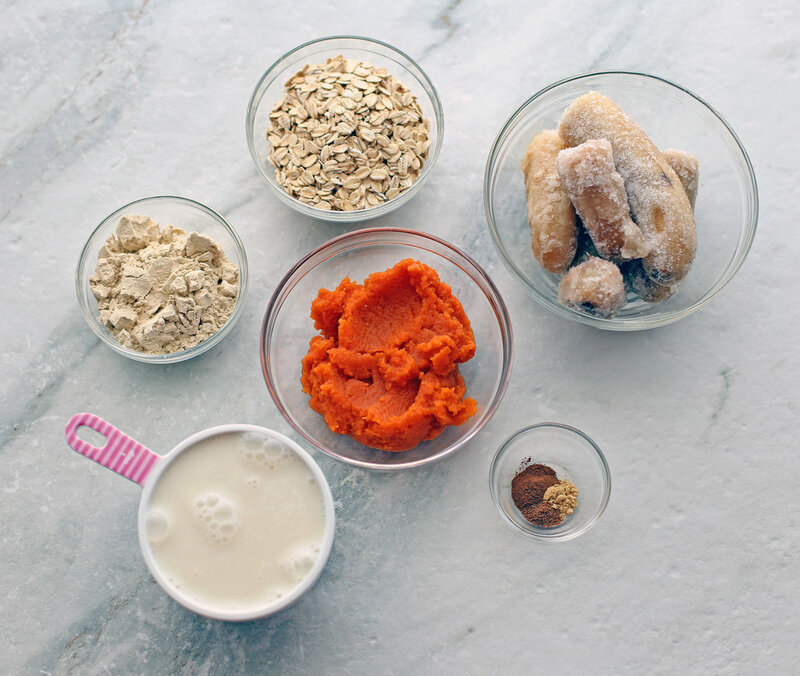 Once blended, taste and adjust according to preferences such as adding more almond milk to thin out the smoothie or more pumpkin puree for additional pumpkin flavour. Best served immediately or chill in the refrigerator. *I used LeanFit Complete Green Protein, which is a plant-based protein powder. **I made a DIY Pumpkin Pie Spice using: 1 tsp ground cinnamon, ¼ tsp ground ginger, 1/8 tsp ground allspice, and 1/8 tsp ground nutmeg. This smoothie has 14 grams of protein per serving (recipe makes 2 servings).